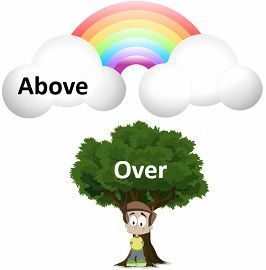 The words ‘above’ and ‘over’ are both prepositions and adverbs which are used to describe the position of any person or object and also when we discuss measurements, i.e. a level which is higher than another level on a scale. When something is above something else, i.e. the first thing is directly perpendicular to the latter, then we use over to indicate the position. On the other hand, when the upper object is not in direct vertical line with the lower object, then we use the word above to describe the location of the object. She lives in the flat above; you can come over my place. The boy lifted his hands above to touch the fan over his head. In these two sentences, you might have observed that the word ‘above’ is used to denote something upwards, i.e. at an extended space over. On the other hand, in the first sentence over denotes a situation or condition that has been placed, whereas in the second sentence over indicates something which is outrightly above one’s head. Meaning Above represents something at a place higher than another person or object. Over represents something that is directly upwards the another person or object. Numbers It is not used with numbers. It is used with numbers. Examples Joseph is intelligent, honest and above all, caring. She worked as a stock market analyst for over 10 years. Ali was watching the sky above. There is a wind chime over your head. We rented the room above our clinic. The investigation will be over when the officers find the culprit. It is a plane hovering above the mall. There is a nail above the window. The temperature is above 50 degrees in summers. She values money above anything else. You can speak to the officer above. We got the instructions from above. The above figure explains the working of the synchronous motor. I will choose friendship above love. The teachers always favour Joe above other students. The word ‘over’ can be used as a preposition and adverb, to talk about something that is at a higher level, as compared to something else. This means that when something is at a higher place covering any person or object and is directly perpendicular, we use the word over, i.e. it extends outrightly upwards from the person or the object. I held an umbrella over my head when it started raining. She put a scarf over her neck. There is no need to think over this issue. Why are you laughing over a silly joke? The Education Minister is coming today to look over the school. Can you see the bike over there? There is a grocery shop over the street. He hit the jug with his hands, and the water spilt all over the table. When I was in a hostel, I talk to my mom daily for over an hour. We will discuss this matter over dinner. The apple fell over the head of the boy. Those who are 18 years and over must register themselves for elections. The contest is over now. My exams will be over by the end of this week. When something is in extended space at a distance to an object, we say that the former is above the latter. As against, over is used when something is over someone/something else or moving over it, then the former is in a direct vertical line over the latter. Both above and over is used to indicate the location of something which is at a higher position, however, ‘over’ expresses the location in a precise manner, in the sense that it indicates movement of the object from one side to another. When it comes to numbers, we use over and not above in a sentence. We use above when there is no contact between the object we are talking about, i.e. there is some space between the two. On the contrary, we can use ‘over’ irrespective of the space between the two objects, provided that the upper object covers the lower one. There is a nameplate above the door. A free medical facility is provided to the persons aged 50 or above. His height is above average. Can you jump over the drain? She is getting over her disease. The alarm rang for over five minutes. You can use above when something is at a higher position, and not touching a person or object. On the contrary, over can be used in different context, i.e. for something which is at a higher position, to cover something or to show preference/interest in something.